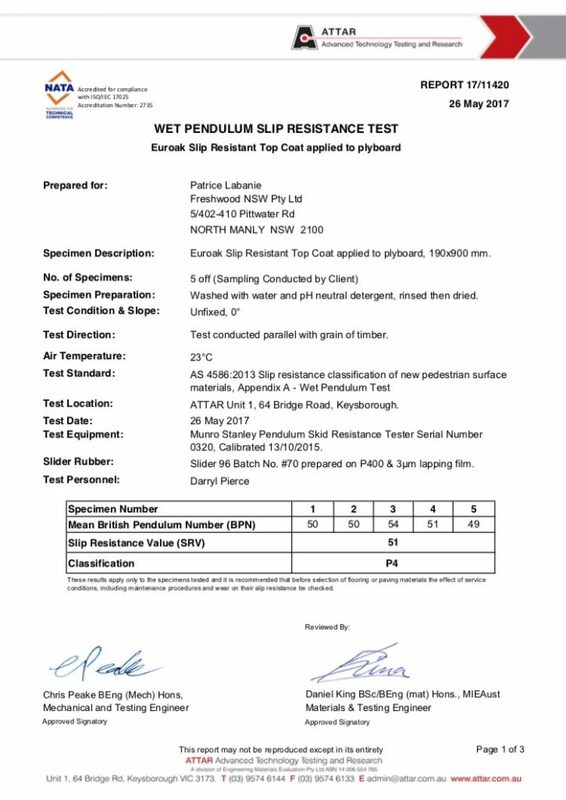 Wet pendulum slip resistance testing is recommended where there is a likelihood of the surface being contaminated with any liquid by rain, accidental spillage or ingress. A wet pendulum test offers the advantage of slip resistance determination in situ, which can be used to quantify slip resistance under a wide range of environmental conditions. Because the wet pendulum test can be applied to installed surfaces, it can also provide a measure of the inevitable change in slip resistance over time, enabling the risk of slipping to be monitored. The principle of the Wet Pendulum Tester to assess the friction characteristics of each specimen is by determining the wet dynamic friction between the specimen and the slider of a pendulum swinging in a vertical plane. Portable instrument is used in the laboratory for classifying the wet slip resistance of new flooring (pedestrian surfaces) materials. It is also used on site to assess the slip resistance of existing floors and pavings. A rubber slider is attached to a spring loaded foot at the end of a pendulum arm (leg). The pendulum arm is released, allowing it to swing so that the slider contacts the wet pedestrian surface over a set distance of 126mm. The slider rubber surface of the device has to be conditioned prior to each testing. This is done using a grade P400 abrasive paper. The extent to which the pendulum fails to reach its release height on the overswing is used as a measurement of the slip resistance. There are two types of slider materials in use; the Four S rubber (Simulated Standard Shoe Sole) and TRL (Transport Research Laboratory) rubber. Of the two, The Four S rubber is the one most commonly used. Once the device is ready for testing, the surface is tested according to the relevant standard specifications. 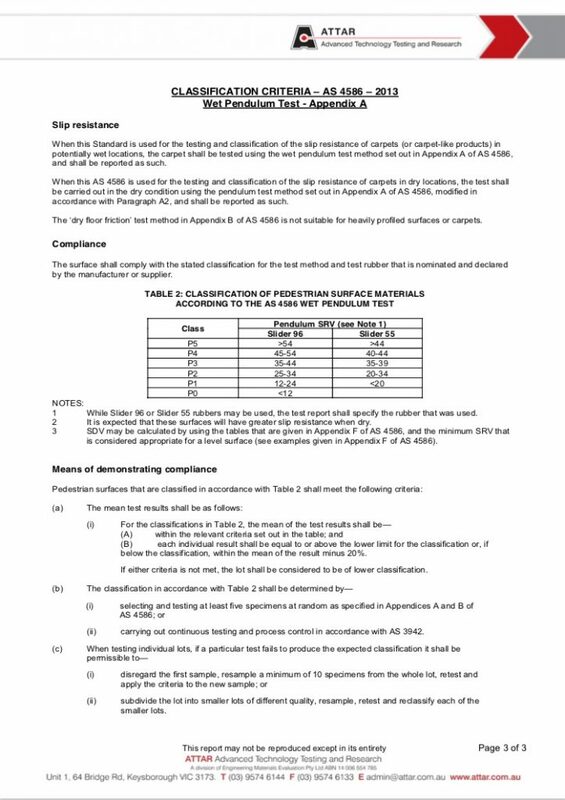 The results are recorded and a slip resistance test certificate is issued. The Building Code of Australia (BCA) has introduced Deemed to Satisfy (DtS) provisions for determining the slip-resistance to treads and nosing to stairways of all Classes of buildings and pedestrian ramps and landings of Class 2 – 9 buildings. From 1 May 2014, treads or nosing to treads of a stairway must comply with a slip resistance classification as tested to Australian Standard AS 4586 – 2013 Slip resistance classification of new pedestrian surface materials. This is a new test method for slip resistance, the old ‘X’ ratings have been replaced with ‘P’ ratings. A Strip at the edge of the landing with a slip-resistance classification not less than that listed in below table, when tested in accordance with AS-4586 (Australian Building Codes Board) ABCB and where the edge leads to a flight below. type of soling material has an influence on the slip potential. Y and Z has forced some manufacturers to use Four S rubber. Recent CSIRO research suggests that TRRL rubber provides a better indication of wet barefoot slip resistance than Four S rubber, so some manufacturers might elect to test with both rubbers. If one presumes that the interpretation for new products includes a factor of safety allowing for some loss of slip resistance (in the more slip resistant products) with time, then there are some potential difficulties in applying the same interpretation to existing surfaces. However, these notional interpretations were intended to be indicative rather than definitive.